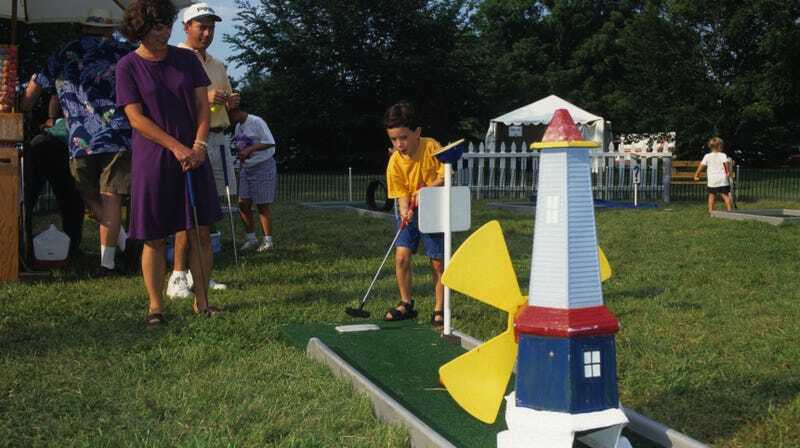 There’s no American sport more egalitarian than miniature golf, which—in stark contrast to its wasteful, bougie bigger brother—requires little more economic outlay than some fake grass, a concrete windmill, and a skeevy guy to rent you your putter. For years, though, minigolf has had to toil in obscurity while so-called “real” golf gets all the big-deal TV coverage, with its breathless, whispery commentary. Well, no more: The game of teensy-tiny kings is about to have its day in the sun. This is per Variety, which reports that ABC is teaming up with basketball star Steph Curry for a new, competitive, high-stakes mini-golf TV show. Holey Moley—which, okay guys—will pit 12 contestants per episode against each other for a $25,000 prize, which is way more than the “bet me $5 I can’t ramp this off the volcano and into the snack bar” money we usually associate with the sport. In addition to Curry—serving as executive producer and “resident golf pro”—the show will also feature The Real’s Jeannie Mai, sportscaster Joe Tessitore, and funny-for-a-sports-guy comedian Rob Riggle as commentators. And can we just say: We’re honestly kind of psyched for this? The worst thing about miniature golf is that most courses never update their look; by tossing a TV budget toward crafting new themed holes every week, this series—we’re not saying the title again—could create some really fun, delightfully stupid stuff. The Simpsons (Classic): "Dead Putting Society"